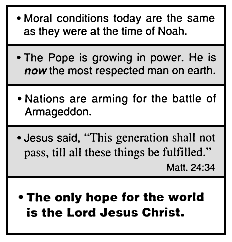 This booklet is titled "The Only Hope," and don't worry--I'm not going to spoil what that hope turns out to be! 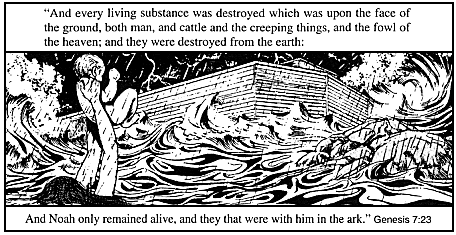 As we open the pamphlet, we are introduced to the antediluvian world of Noah. It is a dark and evil world, a world without morals, ethics, or subtlety. "The only thing more fun than sinning is hamfistedly talking about our sinning! Haw haw!" The Lord, as it turns out, is just so done with all this sinning, so he calls Noah to build an ark. Our comic helpfully devotes an entire panel to God telling Noah to make it out of gopher wood, widely recognized as one of the most important parts of the flood narrative. Noah finishes the ark and it starts to rain...and God freaking kills a baby. "Truly, your God is the Sociopath of Sociopaths! [Glub glub]"
It's not all fun and infanticide though, as we quickly learn that annihilating Earth once just won't cut it for a vengeful deity. After all, we read in 2 Peter 3:10, "The heavens shall pass away with a great noise, and the elements shall melt with fervent heat, the earth also and the works that are therein shall be burned up." Our comic then helpfully adds the following warning: "Scientists laughed at that verse...until we came into the atomic age." Um...not to break the narrative, but exactly which scientists opened the Bible up to 2 Peter--which you may recognize as not the most famous book in the Bible--and, having found 3:10, thought, "Surely nothing in science could melt elements!" On another tangent, I am honestly curious how many people were disappointed when the Cold War ended without a nuclear apocalypse. Fingers crossed with Putin though! In any case, the righteous will be taken up into Heaven by way of the rapture, leaving behind the wicked (and, presumably, Nicholas Cage). Phew! Nothing terrible in heaven, right? "Oh, let me guess, you find a titanic faceless bloodthirsty God weighing indiscriminate judgment on the crowds of ants at his feet 'terrible' now." Remember, we learned at the start of this that God doesn't like casual murders, torture, or gay marriage (which totally belongs in the same sentence with the other things, guys, like seriously). Now, though, we finally get to learn what it is that he really hates. 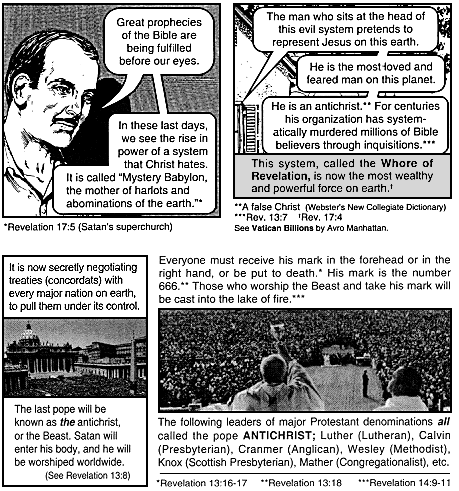 That's right--the Antichrist. "But," the more eschatologically-inclined among you may ask, feverishly, with spittle flecking your lips, "who or what is the Antichrist? The scriptures don't specify!" Not to worry--where the Bible fails, this comic book delivers! I'll give you three hints: it's big, it's a beloved victim of Protestant-leaning conspiracy theories, and some crazy folks say it sort of formed Mormonism. Is...is that Walt Disney up there? 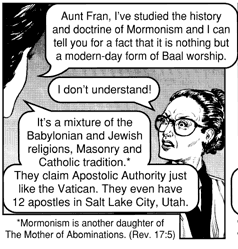 "At least we're not modern-day Baal worshipers, though, 'cause yikes." Having exposed the Catholic church for the abomination it so clearly is (let me just clear my throat loudly here for no reason), our comic book comes to an end. Well, after Russian and Islamic armies invade Israel, of course. 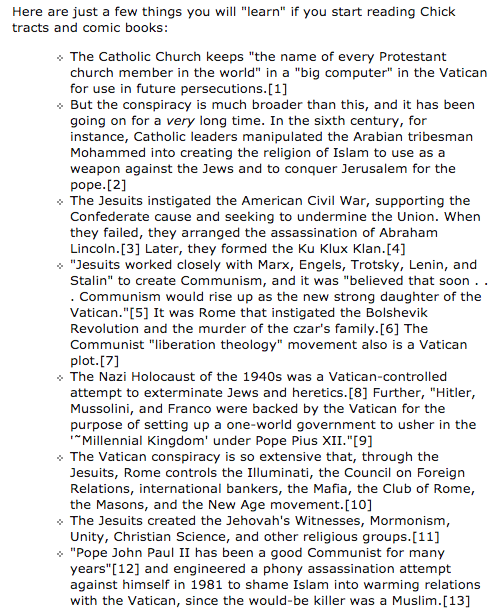 And after ten nations burn the Vatican to the ground. And after the largest army the earth has ever seen has massed itself outside Jerusalem, and after God's heavenly murder-rays graphically rip apart the world's soldiers, and after the Beast and the False Prophet (at least one of which I assume to be the Pope, though details are kind of fuzzy at this point) are cast into eternal hellfire, at which point we finally reach Judgment Day. Hooray! Wow, there is just so much wrong with every one of those boxes. Er...except the bottom one, I guess. Oh, and spoiler alert. The hope is Jesus. I laughed. I cried. I worshiped Ba'al. Just like a good sacrament meeting, then! where you see Walt Disney, I see Eugene O'Neill. After looking up who Eugene O'Neill was on Google, I feel like that makes sense. 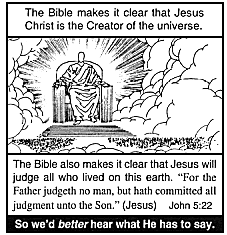 LOL... Chick tracts are hysterical!